Primarily a pest of flowering dogwood (Cornus florida) but also may attack flowering cherry, apple, and various other deciduous hosts. Flowering dogwoods that are older and especially those that have been wounded by mowers or line trimmers are most susceptible. Entrance holes with exuded sawdust are to be found on the main trunk and larger branches. 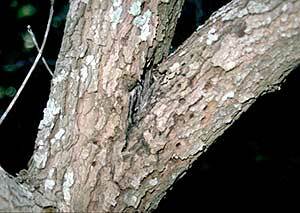 Larvae feed in the inner bark area and damage the vascular system. Classic symptoms of infestation are: top die-back of the plant, adventitious growth along the trunk, main branches and from the base of the trunk. Also, sloughing of the bark may be another symptom. Repeated infestations can greatly diminish the health and aesthetic appearance of the host. The clear-winged moth adults of this pest appear around the time when the last of the petals have fallen from flowering dogwood (late spring-early summer). Their flight activity continues into September. Eggs will be laid on the bark, usually near a wound or branch collar. The newly hatched wood-boring caterpillars require an opening to successfully enter through the bark into the cambial area. Larvae will feed for one year and pupate the following spring. Adults appear beginning around 250 growing degree days (mid-late May in Massachusetts) and continue into September. Specific pheromone traps are available and can help to pinpoint the exact time of adult flight and egg-laying activity. However, this offers extremely little in the way of management. The best strategy is to prevent wounding of the host plant. This involves placing bark mulch around the base of the tree to suppress weed growth thus eliminating the need to bring mowers and line trimmers within close proximity of the trunk. Infested trees are best managed with the use of entomopathogenic nematodes. They can be applied as a liquid spray directly to the trunk and main branches of the host. In low to moderate infestations this should be done in August or September. In more severe infestations, an application should be administered in late April and again in August or early September. Preventative sprays during the adult flight period are available with certain residual-action chemical pesticides but repeated applications are necessary and, given their persistence in the environment, are not recommended as a standard practice. Entomopathogenic nematodes have proven to be at least as effective as chemicals and therefore, their use is highly recommended.